A logo has a strong influence on the success of your business. It is the element which identifies your company, makes it stand out and helps to establish relationships with potential customers. Oftentimes, the design of your logo shapes the first impression of your brand and we all know that a first impression counts significantly. At Web Efficient, we create memorable logos, specifically designed for your unique business. How do I recognize a qualitative logo? No matter what the current trend is, a logo needs to pass the test of time. A simple and adequate design will remain in the consumer's mind. A logo needs to adjust to any publication, be it an online one or a printed one. Almost of the same importance of a professional logo is the style guide. 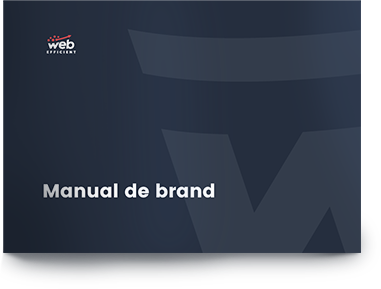 This offers consistency to your visual identity and establishes the guidelines for the appropriate usage of your logo in any given context. for branding & logo design? Our logo was born by combining our ideas with the suggestions received from Web Efficient. We are very proud to be represented by such an adequate logo for our business. Based on our experience with the team, we highly recommend their services. Creating the perfect logo nowadays gives anyone a hard time. Harder still is to keep it simple. Web Efficient managed both.